For ages 4 to 8 years. Over 2,000 years ago, Jesus was born to Mary and Joseph in a town called Bethlehem. 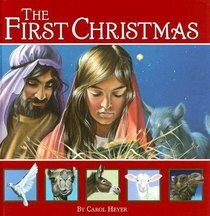 This is the story of Jesus' birth, retold by Carol Heyer in clear and simple language for little ones. Her accompanying artwork is luminous and adds depth to the story of why Christians celebrate Christmas.